Once upon a time, I sort of balanced my characters along gender lines, 50/50 male/female alts. But eventually, I just sort of decided screw this, I prefer something that is pleasing on my eyes. I still have a handful of male heroes, but like many other games, it seems the females have the largest selection of interesting gear to wear. As another female, swtor playing friend of mine said once (she plays mostly male characters, because she likes looking at their butts when they run around in tight pants), It's "Eyecandy"! So... where do you and your friend stand on lovebots or whatever you want to call them? And, in the Blade Runner world, would you date a replicant? In this case, I don't think bots are her thing. As for dating? Hmm, tricky question. Rachel was hot though. How about a game of table tennis? After defeating Zhaitan, I followed a Russian friends advice (she was the one who persuaded me to try the game in the first place) to not start on the natural story progression after that, but to make a detour to the desert expansion and complete the first chapter there. It was all about getting the Raptor now instead of much later. The game added a number of mounts in the Path of Fire (desert) expansion, which makes getting around in the huge world a bit easier. The game uses instance areas and unlocks to create a sense of time progression in the world. This place is called "Sirens Landing" and takes place after you've killed Zhaitan (the undead Elder Dragon). 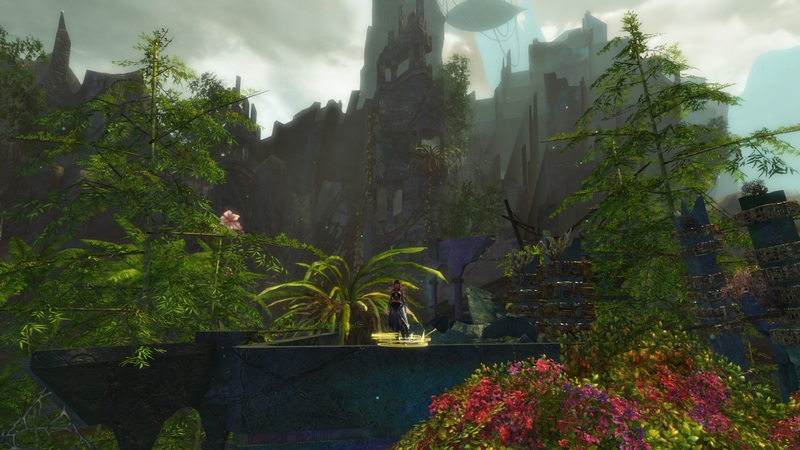 Pact forces and Sylvari in particular are trying to return parts of Orr to the world of the living again, creating flowering gardens and setting wild life loose. It creates this odd mix of new growth and ancient ruins. The place is still crawling with undead though, although now they are called "Unchained", because they no longer are controlled by the will of Zhaitan. 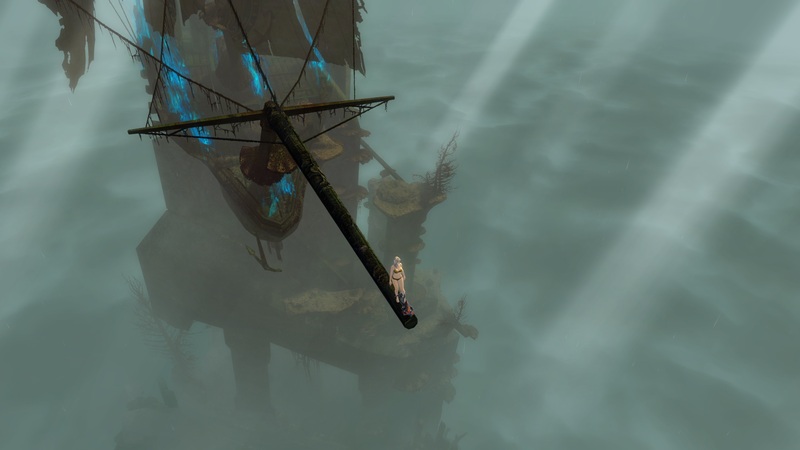 Arenanet (the developer) hates people with vertigo... this jumping puzzle took me 3 days of real time to through, climbing up to the ship stranded on top of the cliff. Luckily there were a couple of checkpoints on the way where you can log out without losing your progress. A bonus achievement too if you put on the diving goggles and jump off the prow of the ship. What looks like ocean way down there isn't water. It's the cloud cover way up in the sky. The ocean is a lot further down.